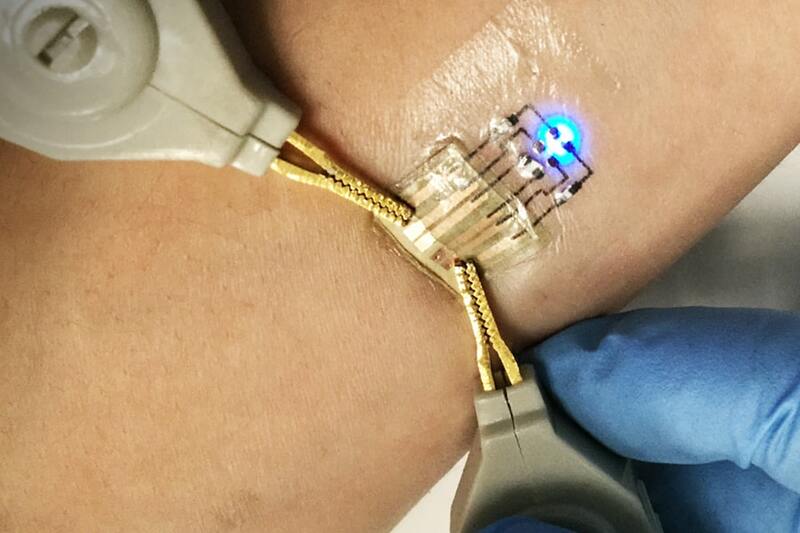 Researchers from Carnegie Mellon University's College of Engineering and the Institute of Systems and Robotics at the University of Coimbra, Portugal, have developed a simple, efficient method to make robust, highly flexible, tattoo-like circuits for use in wearable computing. The low-cost process adds a trace of an electrically conductive, liquid metal alloy to tattoo paper that adheres to human skin. These ultrathin tattoos can be applied easily with water, the same way one would apply a child's decorative tattoo with a damp sponge. Other tattoo-like electronics either require complex fabrication techniques inside a cleanroom or lack the material required for stretchable digital circuit functionality on skin. Carmel Majidi, an associate professor of mechanical engineering and director of CMU's Soft Machines Lab , and Mahmoud Tavakoli, director of the Soft and Printed Microelectronics Laboratory at the University of Coimbra, partnered to develop methods for direct printing of stretchable electronic circuits. The tattoos are being developed under the Strechtonics project, one of the Entrepreneurial Research Initiatives of the Carnegie Mellon-Portugal Program, funded by the Fundação para a Ciência Tecnologia (FCT) and coordinated by Professor Aníbal Traça de Almeida. Associate Professor of Mechanical Engineering Carmel Majidi discusses electronic tattoos, which are circuits made of silver nanoparticles printed on the same film used for children’s tattoos. These electronic tattoos have applications that range from health care to personal electronic devices to gaming. "This is a breakthrough in the printed electronics area," Tavakoli said. "We showed for the first time that inkjet-printed patterns of silver nanoparticles can be sintered at room temperature using the gallium indium alloy. Removing the need for high temperature sintering makes our technique compatible with thin-film and heat sensitive substrates." In addition to low-cost processing, these tattoos provide other advantages. Because they have mechanical properties similar to lightweight fabrics, they remain functional under bending, folding, twisting and strains above 30 percent, which is the typical stretchability of human skin. They can conform and adhere to highly curved 3D surfaces, like a model of a human brain or a lemon. Applications for ultrathin, compliant tattoos include epidermal biomonitoring, soft robotics, flexible displays and 3D-transferable printed electronics. The findings were published in Advanced Materials in a paper titled "EGaIn-Assisted Room-Temperature Sintering of Silver Nanoparticles for Stretchable, Inkjet-Printed, Thin-Film Electronics."